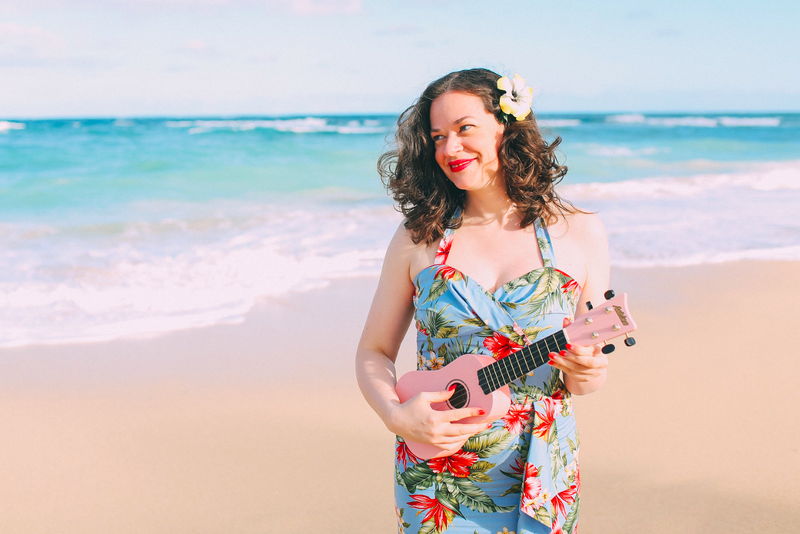 It's the pattern reissued by Simplicity that I made my hot pink blouse and navy trousers from! But wait, where are the trousers? 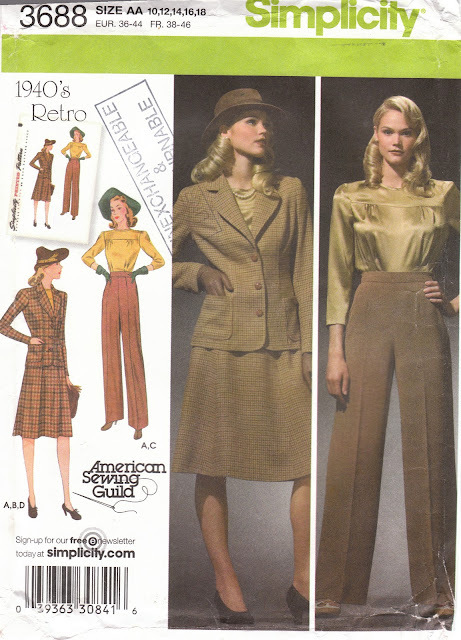 The repro pattern shows the woman in the yellow blouse wearing trousers!! Bizarre....What do you think happened? Whoa, that is so weird! I have no idea. Oh yeah... Do they combine patterns sometimes, like a BOGOF?! You got a deal! Not just the trousers, it looks like the pattern from the other outfit's disappeared in the wash as well! I suspect nargles are behind it. Simplicity did this on another pattern too. It was a 1950's repro that had capri pants in it. I saw the original and it didn't have the pants in it either. Her waistband looks the same, it's everything below that that's changed... maybe there were 2 versions of the pattern originally? Or maybe they figure modern women prefer trousers? Either way, good spot! I think Lauren hit it in the head - they figure modern women want the retro trouser look so they added it on! Whatever the story, very cool to see the original! I've seen a couple Butterick Retros that combined two patterns or added something, I guess they all do it! On the Buttericks the extra patterns I've come across were always also vintage, so these pants probably are too. Oh strange! I wonder how that happened? Probably the others are right, more than one pattern was combined for the reissue! Original patterns would be reissued occasionally with updated art work on the envelope but in this case I agree Simplicity have added in the trouser option. 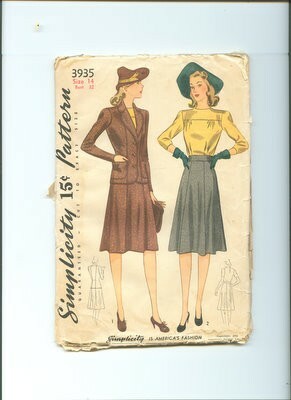 Makes sense when you think there are very few vintage 40s and 50s patterns for trousers unless it is "sportswear" or "pyjamas" (since trouser suits weren't the thing then) and the ones I have seen (that weren't sportwear or pjs) had tapered legs not this lovely wide style. (Note aside: I'm using this trouser pattern for Aladdin's outfit in this year's panto). What a cool find the original is though! Terrible photos. The suit in the repro looks so baggy compared to the crisp original (an illustration, admittedly...). With so many repro pattern photos, I get the impression that someone makes the outfit, then they find a model... the fit is so approximate sometimes! Hey! I have the original pattern for that. I never realized the new one has trousers. What do you know? EVERYONE wears green gloves with trousers ;) How funny... looks like some photoshop action. Not a big fan of the materials they made the blouse up in on the new cover.